Do you often look up at the night sky wondering what is out there? What do our nearest neighboring planets look like? What do Saturn’s rings look like or maybe you want to look for the “little green men” on the surface of Mars? You’re not the only one. This has happened to everyone since the dawn of mankind. We totally understand you always need more than the naked eye to peer further into the heavens. The way to go about that is tracking down an optical aid to increase the power of your eyesight. Unless you are a superhero, that is going to mean something like a telescope or binoculars. If you are wanting to see the other planets in our solar system then the thing that you need is the best telescope to see planets. We have compiled a comprehensible list of the best telescopes for viewing planets, whether you are a novice or a well-experienced stargazer. 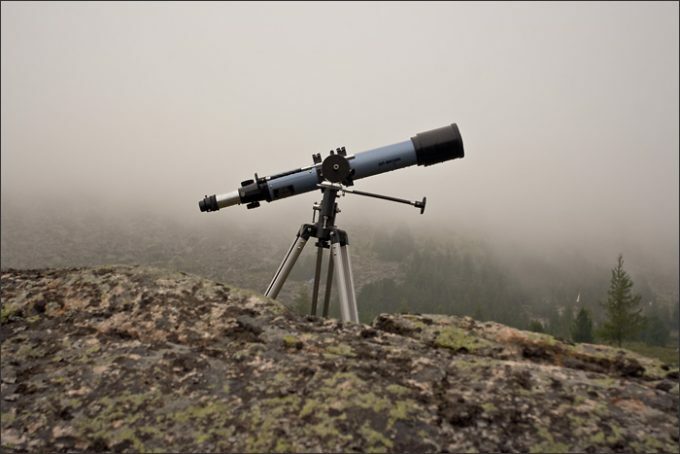 We have also outlined the basic features of telescopes that you need to know when going for the purchase. Being an astronomy enthusiast you probably know the basics related to telescopes. However, we have gone the extra mile to explain all the important features you will need to know if you plan on investing in a decent telescope and want to watch all the amazing features of the planets in our Solar system. An important role for observing the planets has the aperture of a telescope. A short and simple definition of aperture: the opening through which light travels; which in turn determines the appearance of the image plane. The focal length is also an important measure for planet viewing telescopes. It is basically a measure that determines the magnification of the telescope. We will not get into any scientific definitions here, and only say that the focal length of the objective lens of the telescope and the lens of the eyepiece are in direct correlation and give the magnification power of the telescope. Together, these two will set the limit for how much you can accomplish with a given telescope. Basically, for planetary viewing, it is recommended that you use a telescope with long focal length and large aperture, also known as “slow” telescope. The eyepiece has a remarkable role in planet observation. In order to get a good image of a planet you will need an eyepiece with short focal length and high magnification. When considering planet viewing, you should remember that the eyepiece should not exceed more than about 50x magnification for every inch of aperture you have. For example: if you have a telescope with a 4 inch diameter (aperture), then you should not go higher than 4 x 50 = 200 magnification power. One very important feature of any telescope is its mount. It is the mount that provides the steady position which is the basis for a clear image. There are two basic mounts for telescopes on the market today–the alt-az mount and an equatorial mount. However, in recent times, there are computer–controlled telescope mounts that prove themselves useful for beginners, as they have many objects in their database. 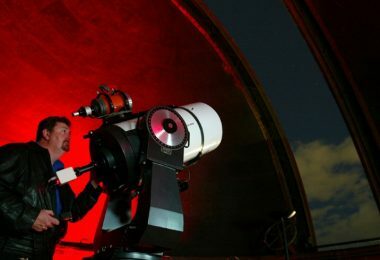 For seeing good details on planets, you will ideally want a telescope with an equatorial mount or computer – controlled go – to mount. For planet viewing, you should consider getting a telescope with narrow field of view. This is because the light reflected from the planet comes from a very, very small part of the sky, and you should only focus on this small patch, and not on the surrounding black sky. So, after you spend some time in changing the telescope eyepieces, you’ll find out that not only magnification varies with eyepieces. Field of view or FOV is one of the most important and primary differences in how much sky you can see with your telescope eyepiece. Usually, multi-element telescope designs that are more complex provide a very wide view field and they can also make restitution for the simple objectives with low f/ratio. So, it’s not important that you have the biggest telescope, but the one with the largest field of view. Which brings us to the next important feature. Bigger doesn’t mean better when it comes to telescopes. It’s preferred that you choose a long focal length, especially if you’re planning to observe high-power objects like planets, Moon or double stars. So, if you dream of seeing galaxies far, far away, then opt for one with a large objective. But if you’re into sparkling showpieces or the Milky Way, then a small, short scope will do the job perfectly. You probably wonder why is this the case, but it is, thanks to the higher power that let you see a nice sky patch at once. When you look at the standard eyepiece (usually those with 1 ¼ inch barrels and a 20 inches focal length) you’ll be able to take a look at the entire Orion’s Sword, but if you opt for the one with 80-inches focal length you’ll barely be able to observe the Orion Nebula. Above, we have outlined the most important features you should know about telescopes for a great view of the planets. Below, we have made reviews of top rated products for every budget. Keep on reading and by the end of this list, you will be properly informed and able to make a decision about buying the top planetary observation telescope. Description: The Celestron NexStar 130SLT Telescope has some very good features when it comes to a telescope for planet viewing. The telescope has Newtonian reflector design, with aluminum coated primary mirror. The magnification at its highest useful power is 307x, and the lowest usable power is 19x, the aperture is 130 mm and the focal length is 650 mm. This telescope comes with two eyepieces, the magnification of the first one is 25 mm with 26x magnification, and the second one is 9 mm with 72x magnification, which is perfect for seeing all the planets as well as some more distant celestial objects. It is mounted on a steel tripod, with motorized alt-azimuth mount for easy tracking of celestial objects. You do not need additional tools to set up your Celestron NexStar telescope, as it has a quick release system. It also has the Celestron SkyAlign system to align the telescope onto three bright objects. Given the approximate location, date and time, the computer knows where in the sky the three objects are located. This is very useful feature when you are looking upon a partially cloudy sky, and you don’t need star maps or compass to align the telescope. 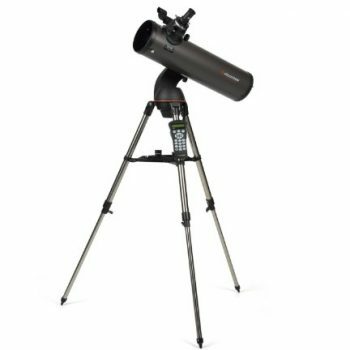 The telescope comes with tripod, mount, two eyepieces, finder scope, a simple instructional brochure and 2 CDs with software. Related: If you are considering getting the Celestron NexStar 130 SLT Telescope, you should consider investing in an AC adapter like the Celestron AC Adapter. This powers your Celestron computerized telescope from any AC standard wall outlet and you will not have to use it with batteries when near a power source. Another interesting purchase is the Celestron 1.25″ Accessory Set, which features five Plossl eyepieces, 2x 1.25 inch Barlow lens, six colored planetary filters and a 1.25 inch Moon filter. Description: The Orion SkyScanner 100mm TableTop Refractor Telescope is the ideal reflector telescope for beginners. It features 100 mm primary parabolic mirror and focal length of 400 mm, and you can easily see the surface of the Moon, Jupiter and the other planets. It has a tabletop design and is very lightweight, so you can easily take it outside and use it, and later store it on a desk or even in a closet. It comes with two 1.25 inch eyepieces, one 20 mm for 20x magnification and the other 10 mm for 40x magnification. Also included is the Orion EZ Finder II reflex sight that allows for easy aiming of the SkyScanner telescope. As this is a relatively entry level telescope, you can only see large objects in brighter settings, however if you take the Orion SkyScanner in a darker environment, you could also see other objects in the Milky Way. This telescope comes with two eyepieces, EZ finder II reflex sight, threaded adapter for tripod mounting and Starry Night Special Edition astronomy software. Related: When considering getting the Orion SkyScanner 80mm TableTop Refractor telescope, it would be very smart to invest in a suitable Moon filter, such as the Orion 1.25 Inch Moon Filter for reduction of glare so you can easily observe the Moon. It transmits only 13% of the incoming light, giving a more contrasting image of the Moon. Another interesting purchase is the Orion Shorty 1.25 Inch 2x Barlow Lens, which doubles the power of the eyepiece. Description: The Celestron 60LCM Telescope features a refractor design with a quality 60 mm aperture. It comes with two eyepieces: one with 25 mm focal length for 28x magnification, and the second with 9 mm focal length for 78x magnification. It has built-in StarPointer finderscope; motorized alt-azimuth mount with a quick release accessory tray on an aluminum tripod stand. The highest useful magnification is 142x and the lowest is 8.57x. The optics are fully coated. The alignment is achieved through SkyAlign method, or Auto 2 star align, 1 star align and Solar System Align. There is the fully computerized hand control, and also the database with 4000 objects in store. 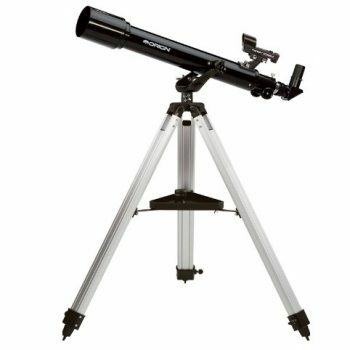 It’s worth emphasizing that this is the most affordable computerized telescope from this brand which is something we like as it provides a very good view of planets and the Moon with its classic refractory optics’ style. In short, this is a complete telescope system. Related: When going for the Celestron 60LCM telescope, it is smart to invest in the Celestron NexStar Optical Tube Carrying Case in order to protect the telescope from damages. The outer shell is pretty strong and hard enough for easy carrying and comes with additional pockets for some extra space in case you want to store lenses, extra batteries, cleaning tool, or even a tripod. The Orion AstroView 90mm Telescope is a powerful telescope for variety of applications. It has a 90 mm aperture and a focus length of 910 mm, making it very suitable for observing the Moon, the planets, as well as other deep celestial objects. It comes with two eyepieces. One is 1.25 inch 25 mm Sirius Plossl eyepiece, offering 36x magnification for crisp images with high contrast; the other one is 10 mm Sirius Plossl for 91x magnification power, for viewing high details and close up images. This Orion telescope comes with a 90° star diagonal for comfortable viewing without having to twist yourself into uncomfortable position. It also has a 6 x 30 finder scope for accurate aim. 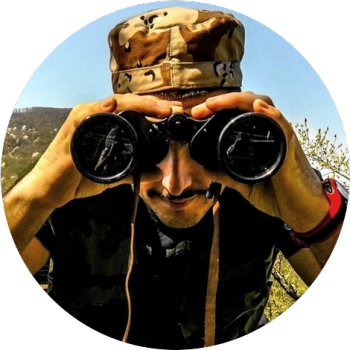 You just find the object you are looking for through the finder, which is aligned with the telescope and you have accurate aim without having to mess up the telescope magnification. 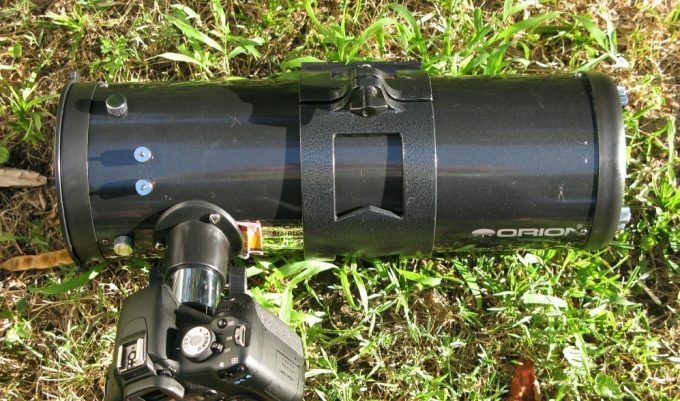 The Orion AstroView 90 mm is mounted on a sturdy EQ-2 equatorial mount, for easy tracking of celestial objects as they migrate over the night sky. 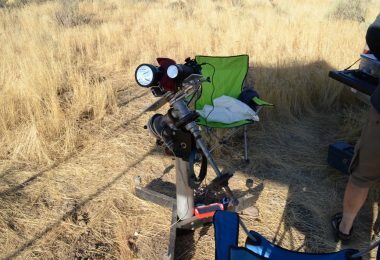 The equatorial mount is positioned on a tripod with extendable legs. This telescope comes with a variety of accessories and also with the Starry Night Special Edition Planetarium software. 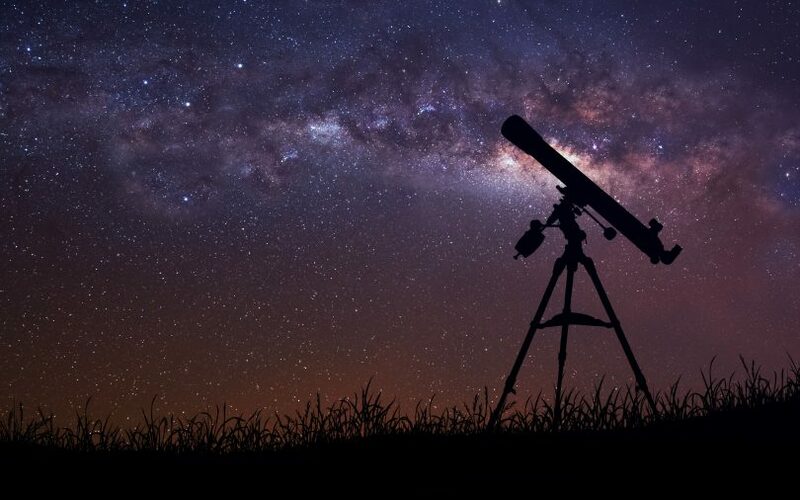 Related: If you plan on taking astronomy as a new hobby, then you should definitely consider the NightWatch Guide to Viewing the Universe – one of the best stargazing guides in the world. It holds a section of star charts for hobby astronomers, and every new edition has even more revisions and additions. 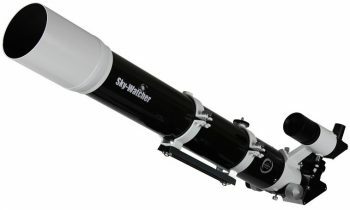 Description: The Sky-Watcher ProED 100mm Telescope is one of the leading telescopes in its class. 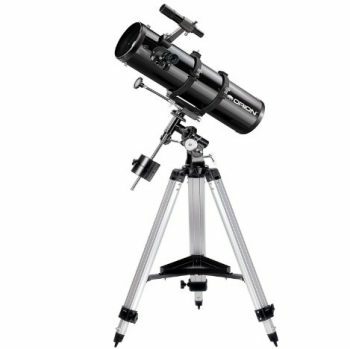 It is built with very good quality and attention to detail; this telescope is a dream to have if you are an astronomical enthusiast. The telescope has a refractor design that provides crisp, sharp images of the desired objects. Built with quality glass lens from Schott glass, and with a metallic high transmission coating, the lenses undergo a thorough inspection to ensure top quality product is delivered to you. It comes with two 1.25 inch eyepieces; one 20 mm and one 5 mm focal lengths. The location of the desired object is easily achieved through the 8 x 50 RA viewfinder that is mounted and aligned to the telescope. Because of the refractor design, this telescope also has a 2-inch dielectric diagonal to facilitate the viewing. The housing is built from tubular aluminum, and this model does come with attachment hardware on the optical tube for easy and securely attaching to compatible mounts. Related: Because the Sky-Watcher is not sold with mount, this is the first thing you need to get when buying this telescope. The recommended mount is the Celestron Advanced VX Computerized Mount, with improved performance for easy tracking. It has integer gear ratios, enables easy imaging across the meridian without interference, can be used between 7 – 77° latitude, and uses NexStar hand control for all – Star Polar alignment. Description: The Orion SpaceProbe 130ST Equatorial Reflector Telescope is an excellent choice for beginner astronomers. It has large aperture to capture more light and enable viewing of the planets in more detail, as well as the Moon and other bright celestial bodies. This reflector telescope comes with two Sirius Plossl eyepieces, one with 20 mm and the other with 10 mm focal lengths, the first offering 26x magnification, and the second 65x magnification. The telescope has a lowest useful magnification of 19x, and a highest useful magnification of 260x. The location of the desired object is easily achieved with the 6 x 30 finder scope; and the focus is achieved by a 1.25 inch rack and pinion mechanism. This model does not have computerized mount, but has sturdy EQ – 2 equatorial mount with adjustable tripod with manual slow motion tracking. In the box along the telescope tube, you get the mount and tripod, finder scope, the suitable counterweight and all the necessary additions and tools, also a collimation cap, dust cap and the Starry Night Special Edition Planetarium software. Related: If you are planning on purchasing the Orion SpaceProbe 130ST Equatorial Reflector telescope, you should consider investing in an Orion Telescope Case, to protect your new telescope and make storage and transport easy. Description: The Celestron PowerSeeker 70EQ Telescope is a surprisingly good telescope for its pricing. It has fully coated glass surfaces with high transmission coatings for increased image brightness and clarity. It comes with two eyepieces: one with 20 mm focal length and 35x magnification, the second with 4 mm focal length and 175x magnification. It also comes with 3 Barlow lenses to triple the magnification of each eyepiece. The highest useful magnification is 165x, and the lowest useful magnification is 10x. 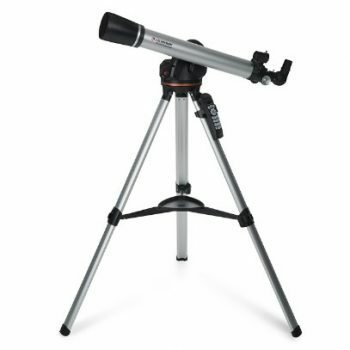 The telescope comes with a 5 x 24 finder scope for easy location of the desired objects. 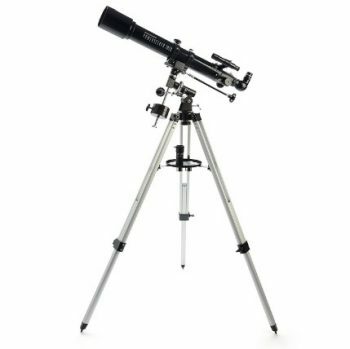 The telescope is mounted on a German equatorial mount, with suitable tray and eyepiece holder, no tools needed for adjustment. The tripod stand is made from aluminum. What is cool about this telescope is that it’s all about a no-tool setup design, which means you’ll be able to use it pretty quickly as it require minor assembly. Related: When going for the Celestron PowerSeeker telescope, you should consider getting the Celestron PowerSeeker Accessory Telescope Kit, which comes with several interesting items: 15 mm Kellner eyepiece, 9 mm Kellner eyepiece, #80A Blue Planetary filter, #25 Red Planetary filter, Moon filter, cleaning cloth, all in a plastic carrying case. Another interesting purchase is the book 50 Things to See with a Small Telescope, which is excellent choice for the beginner stargazers out there. 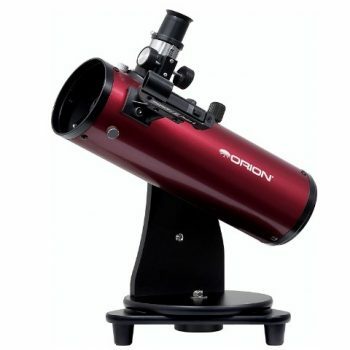 Description: The Orion Observer is a great choice for a beginner’s telescope. It has an aperture of 70 mm, with a focal length of 700 mm, and comes with two Explorer II eyepieces. One has 25 mm focal length with 28x magnification, and the other is 10 mm with 70x magnification power. The telescope has a highest useful magnification of 140x, and lowest useful magnification of 10x. For easy locating of the desired object, it comes with an EZ Finder II reflex sight. 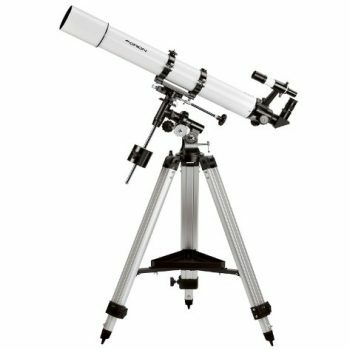 The body of the telescope is made from aluminum; the focus is achieved by smooth action rack and pinion focuser mechanism. The glass lens inside is multi–coated, and gathers more light for brighter, more detailed images of the night sky. This telescope can also be used for terrestrial observation. It is mounted on an alt–azimuth telescope mount that provides smooth up/down and left/right pan motion, set on an adjustable height tripod. It also has a 90° mirror diagonal for viewing without having to twist your body into uncomfortable positions. In the box there are: the telescope, two eyepieces, 90° mirror star diagonal, alt–azimuth mount, tripod stand, EZ Finder II scope, accessory tray, all the necessary nuts, washers, screws and knobs, a dust cap and Starry Night SE astronomy software. Related: When considering getting the Orion Observer 70mm telescope, a good buy is also the Orion Star Target Planisphere for finding your way around the sky. It’s basically an essential tool that identifies stars, locates galaxies and planetary nebulas. 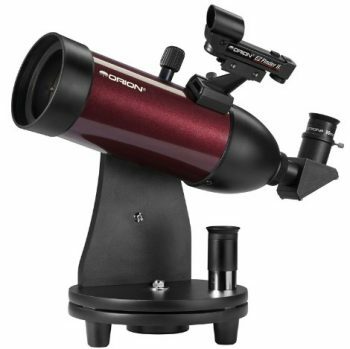 Description: The Orion GoScope 80mm TableTop Refractor Telescope is a very suitable choice for the novice astronomer that is getting started in viewing planets. 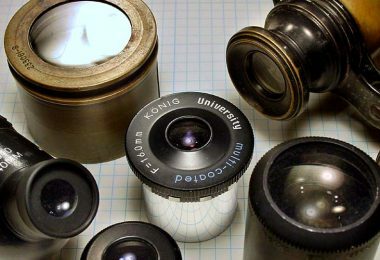 The lens is coated crown glass for clear images. It comes with two eyepieces; one with 20 mm focal length and 17x magnification, the other with 10 mm focal length and 35x magnification. The telescope has highest useful magnification of 160x and lowest useful magnification of 12x. The location of the desired objects is facilitated by the EZ Finder II sight; the viewing is also facilitated by the 90° mirror star diagonal. The body is made from lightweight tubular aluminum. 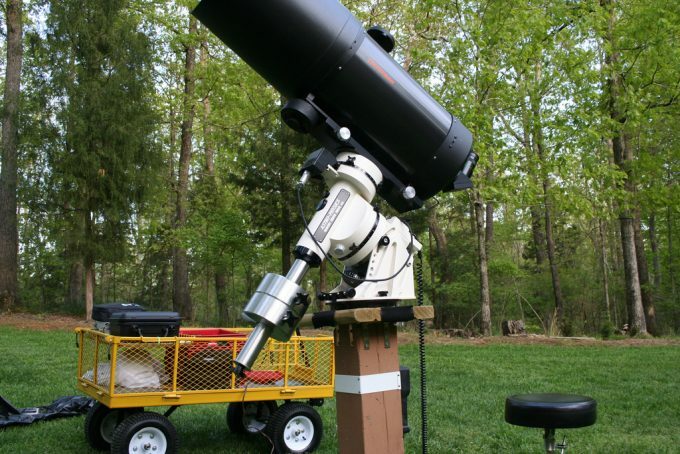 The telescope is mounted on a simple alt – azimuth mount that is designed to sit on a table top, making this telescope suitable to use in on a backyard table, building roof or favorite observing place. The Orion GoScope 80mm refractor telescope comes with 90° mirror star diagonal, two eyepieces, EZ Finder II reflex sight, a threaded adapter for tripod attachment and Starry Night Special Edition Planetarium software. Related: This is a reasonable purchase for a child or beginner astronomer, so reading the Child’s Introduction to the Night Sky: The Story of the Stars Book, hardcover will be useful and enjoyable. With lots of stargazing and astronomy information, younger readers will develop their interest and even more engage into astronomy. Viewing the planets can be a fun and rewarding way to spend an evening, or even an entire night. You will no doubt find the process all the more enjoyable with the proper equipment, and that begins with a good telescope. We have made a comprehensive analysis of the several best telescopes for planetary observation that fit various budgets. 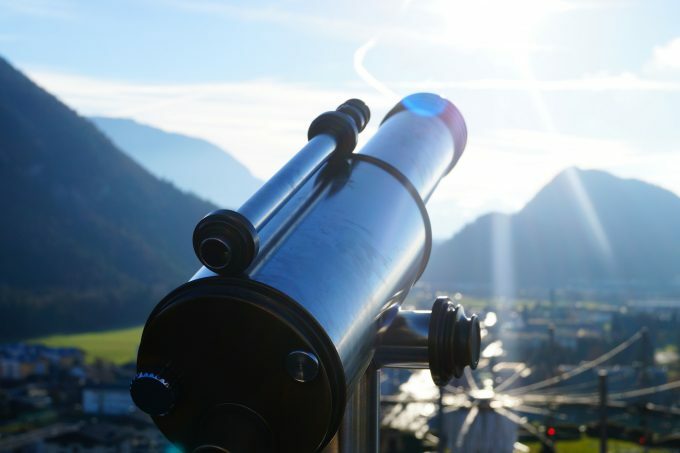 We have explained the basics of a telescope and outlined all the important stuff that you need to know before you make your purchase. Now it is up to you to choose the one that best suits your needs and budget. Be sure to share your experiences with our readers in the comments below.